Hello, friends! Are you grinding your teeth more these days? Do you have a teen who is starting to look tired in the morning? If so, your college planning family may have caught a case of the We-are-getting-a-teensy-bit-stressed-about-applying-for-college flu. Q: When should my daughter start working on her college application essays? A: She can start now (in the spring) if she is ready. Some students start now or before school ends. Some start in the summer and make sure they finish before school starts. Some start in September. But if you are reading this now, you are thinking ahead, which is GREAT! Planning is one excellent medication for the We-are-getting-a-teensy-bit-stressed-about-applying-for-college flu. One quick, easy way is prepare is to sign up for my Wed. May 2, 2018 Secrets for a Strong College Application Essay class at Old Liberty High School in Saline. Parents and students are welcome! I promise that you will feel better walking out than when you walked in. Read how to sign up for this $19 class here. It will be a power-packed hour and a half, starting at 7 PM. Q: Do you know when applications open up and you can start signing in to portals to identify essay topics? A: The Common Application (also known as Common App) essay questions at commonapp.org are available now and won’t change. This means students can start their Common Application essays now. The Common App essay goes to most colleges. Many colleges also require their own additional essay. College-specific essay prompts are usually available by August, and can be found on the Common Application and on individual college websites. 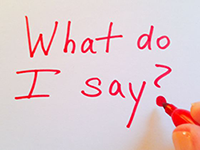 According to the Common Application, the most popular essay prompt of the 2017-2018 application year (through January 5, 2018) is “Discuss an accomplishment, event, or realization that sparked a period of personal growth…” (23.6%), followed by the topic of your choice option (22.5%), and “Some students have a background, identity, interest, or talent that is so meaningful…” (21.4%). “Through the Common App essay prompts, we want to give all applicants – regardless of background or access to counseling – the opportunity to share their voice with colleges. Every applicant has a unique story. The essay helps bring that story to life,” said Meredith Lombardi, Associate Director, Outreach and Education, for The Common Application. Read more about the common application here. Q: Anything else you would recommend for college planning at this point? A: Help your teen get organized, if he isn’t yet. College-specific essay prompts overlap, so it is great to have a file (Excel or a table in Word) where a teen keeps a list of the essay prompts for each school, as he or she learns about them. If you would like to offer your son or daughter a personal tutor to assist them with their college essays, I’m happy to help. Please write to me at debbie@essaycoaching.com for details or call me at 734-646-5985 for a short, helpful phone chat. 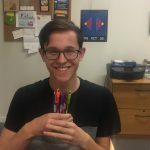 Congrats to Lucas (pictured) for his admission to University of Michigan for voice performance in 2018. 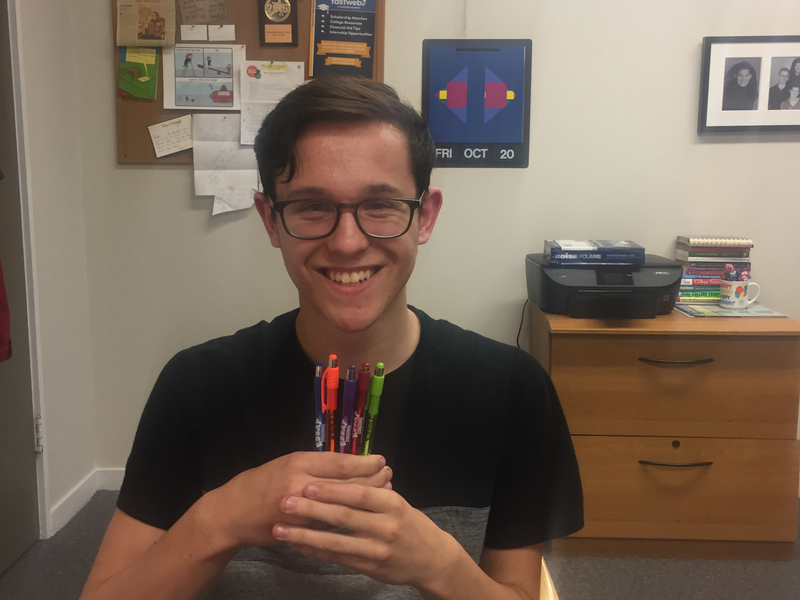 He is happily holding Essay Coaching’s 2018 giveaway pen collection in great green, realistic red, particularly compelling purple, blatantly awesome blue, and original orange.